The acclaimed theatrical concert, which features an all-new Let It Be Part II reunion concert, proved such a hit with audiences and critics alike when it was premiered last year and a sell-out European Tour, that it is now returning for a new UK Tour. 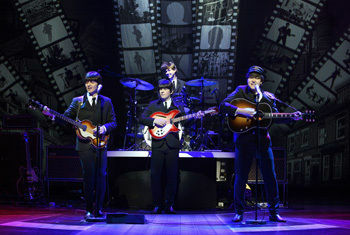 Act One takes the audience through the early days of the band as they embark on their musical journey and onwards to the heights of global Beatlemania. The historic Royal Variety Performance, Shea Stadiumand those iconic Sergeant Pepper costumes all feature. The first half of the evening features many of their most famous songs including I Want to Hold Your Hand, Day Tripper, Sgt Pepper’s Lonely Hearts Club Band, Penny Lane, A Day In The Life, Come Together, Get Back, and The End. In a twist from the original Let It Be show, Act Two is set a decade after The Beatles went their separate ways, giving fans a rare glimpse of how the Fab Four could haveCome Togetheronce again to perform. Audiences are taken on a memorable and unique step back in time to the reunion concert taking place on 9 October 1980 – it’s John Lennon’s 40th Birthday. This is the ultimate concert that never was. The band reunite for one night only, just Imagine. The band’s solo material featured in the show includes Starting Over, Band On The Run, Black Bird, Got My Mind Set On You, My Sweet Lord, Live and Let Die, and Imagine. This new UK tour during 2019 coincides with a number of iconic anniversaries in the history of the most successful band of all time, The Beatles – who started out as just four young lads from Liverpool. This year marks 50 years since The Beatles took those infamous steps across the pedestrian crossing outside EMI’s Abbey Road Studios in London, which went on to become one of the most famous album covers of all time. Sadly, it also marks the 50th anniversary of the group playing together for the final time with a rooftop performance on top of the Apple Corps building in London’s Savile Row.They also finished recording Abbey Road – and this year also marks half a century since the album was released. “The original Let It Be was a hit with Beatles fans all over the world, but UK audiences’ reaction to the new show and the new Act Two reunion concert that never was, has been nothing short of phenomenal.